July 18, 2017 is the bicentennial anniversary of Jane Austen’s death. I have read her books, seen the movies and read her letters. She has inspired me to write Regency and learn about the royal navy and even imagine strolling the streets of Bath. I have numerous copies of her novels. But there is one book that twists my heart with a mere mention of its title and that is Persuasion. 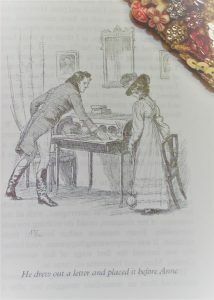 Jane’s last novel, which was published after her death in December 1817. 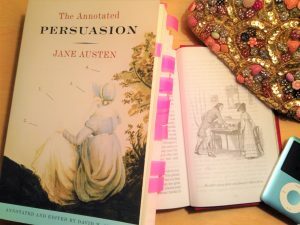 Persuasion is my favorite Jane Austen for two reasons. The first reason I love this book is its theme–a second chance at love and the second reason is the dishy, perfect hero Captain Fredrick Wentworth. No doubt, you must have read the novel (if you are reading this, it is likely that you are a Jane Austen fan) so I will not go into the plot. With Fredrick’s return and Anne’s family’s fortunes dwindling, both Anne and Fredrick now have a chance for second love. Their love has never died after a denial and eight long years. As I read Jane’s words, I cannot stop from imagining Fredrick out at sea, heartbroken and carrying that pain. And when he returns he is now a man of fortune and gets the chance to show Anne what she denied. We all have wanted to do that and some have had the chance to do it. And Fredrick does what many have done and acted as if he is not pained by the sight of her. Though, he is unaware that she too had been tormented by what could have been. Captain Wentworth leaving Anne the love letter. When Fredrick learns Anne still loves him, he takes his chance. And oh, the way he declares it, tears fill my eyes and my throat closes up and my bottom lip shakes. I must go, uncertain of my fate; but I shall return hither, or follow your party, as soon as possible. A word, a look will be enough to decide whether I enter your father’s house this evening, or never. Reading this novel, I feel the love between Fredrick and Anne as well as the longing. These emotions seep from the ink and soak into my skin and fill me. I can’t stop myself and must always hug it to my heart. Then I can’t help but wonder–As Jane neared death, did she yearn for a second chance at love? She must have. We all do.